Technology has completely transformed each and every one of our daily lives. It has made us more productive, given us greater access to information, and simplified procedures that used to take days, weeks or months to complete. At The Service Companies, we believe that technology is integral to increasing the productivity of our associates, creating best-in-class employee engagement and training programs, and providing the highest quality service to our customers and their guests. 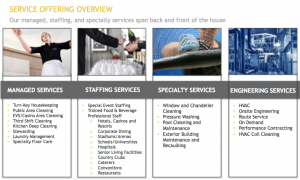 As the premier provider of cleaning, staffing and managed services to hotels, casinos and vacation ownership resorts nationwide, The Service Companies has made a significant investment in proprietary technology to increase the efficiency of our Managed and Staffing Services. Recruitment, training and employee engagement typically involve the most investment of money, time and energy from Housekeeping operational leaders. We recognized that our 30 years of success had provided us invaluable operational and recruiting knowledge that we translated into our own system – Talent Acquisition Metric System (TAMS). 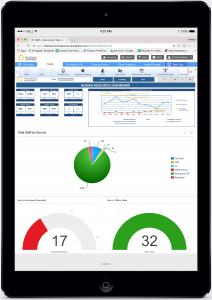 In 2016, we launched TAMS, which allows our Talent Acquisition team to create daily task lists focused on ground level recruiting, to analyze historical data on staffing levels for each of our customer’s properties (enabling us to anticipate ebbs and flows), and to review real time dashboards reflecting staffing levels at our properties and regions throughout the country. The Service Companies has successfully quantified the productivity of their team members. With our proprietary Flash Program portal, our operations leaders and executive team can view and track the productivity of a Housekeeping Department as well as analyze the daily productivity of each Guest Room Attendant. For any Guest Room Attendant that falls below a certain range, we pin point the issue and work on a resolution to increase those scores. Our portal is transferable across the multiple brands we operate within, and comes complete with a mobile site accessible via tablet. Our Executive Housekeepers get real-time, actionable intelligence to help them manage their teams and properties. In 2016, The Service Companies partnered with an external consulting company to collect data and analyze why associates join or don’t join our team or stay for a certain amount of time. The intelligence we gather through this exhaustive analysis of our on-boarding and retention strategies will help us get a clear picture of what we can improve on so that we continue to be the premier employer of hourly associates in the managed service space. Coming in 2017, The Service Companies will be launching a customized and proprietary training and engagement mobile app, Star Service Training. While we have been utilizing digital training checklists, inspection forms and tools for years, Star Service Training enables us to keep all of the files in one place that our associates can access on their phones to complete. Training will be able to be completed on the app, with our most anticipated augmented reality feature that enables the phone to complete the inspection itself using the camera. Associates will be recognized and rewarded with points, which they will then be able to use to purchase gift cards and items from The Service Companies’ online store. This training app and our other proprietary technology will also be integral to the operations of a new simple, reliable and compliant housekeeping staffing service for hotels and resorts that The Service Companies will be launching in January 2017. As a large, well-capitalized strategic hospitality partner, we continue to invest in, and help develop, the latest technology to streamline our processes and increase efficiency across all departments of our organization, which also enables our customers to command premium pricing and potentially produces savings.